If you feel â€œstuckâ€ in a situation that appears to be beyond your control, these stories will show you how others have coped with crisis and uncertainty, made tough choices and positive changes in order to find deeper meaning and satisfaction in their relationships and learned to live with purpose every day. Rarely do we find a book that addresses so many different challenges. LifeChoices does this in a powerful and inspiring way. This book is about experiences, the people who lived them, and how they created successful lives. From values and self-fulfillment to legacy, this book offers new resources for people who have tough choices to make every day. This book was pretty good. The nice thing about books like this with multiple writers is that if you don’t like one writer, it doesn’t ruin the whole book. I really honestly enjoyed some of the stories, while others I read through just so I could give an honest review of the entire book. I thought it was going to be more like a Chicken Soup for the Soul book but it wasn’t. Otherwise it was a good book. The stories were encouraging and tell how others reached success and happiness. I believe you will like this book as long as understand what kind of book it is. I really enjoyed the quotes throughout the book too. Very applicable and smart quotes! All the authors are brilliant and leave such amazing lives. I strive to live like them. 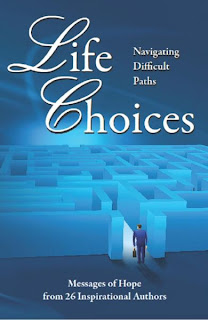 Buy It: You can buy Life Choices for $24.95. It is on sale for $17.96 on Amazon right now.